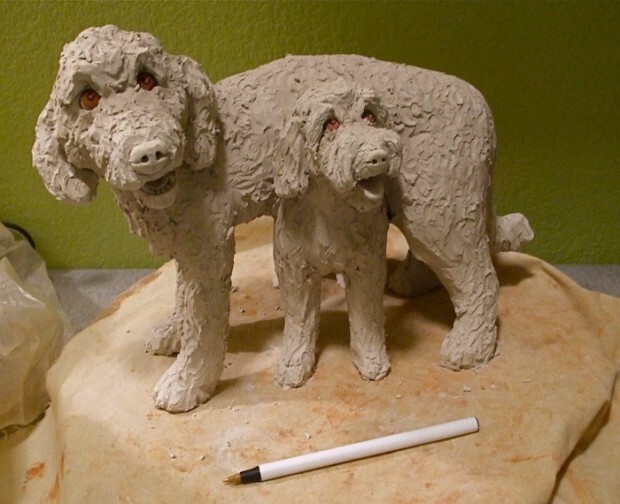 To show a little more about my process, here is how the custom pet sculpture entitled “Attached at the Hips” took shape. I based the sculpture (right) on the customer’s favorite photograph (left). I build my animals from the ground up. 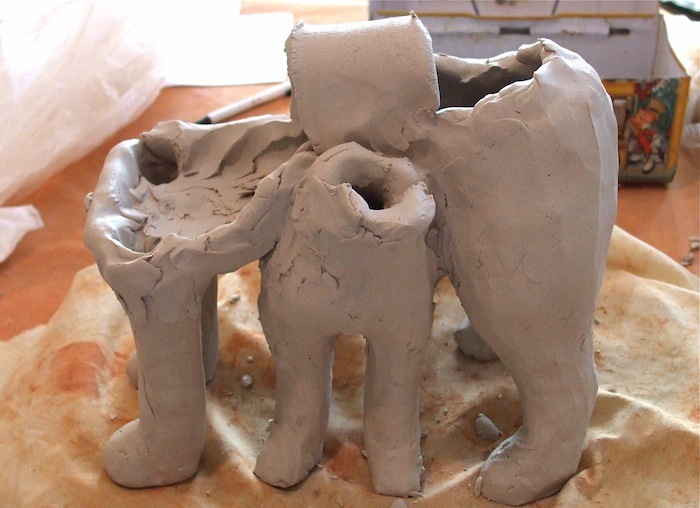 This sculpture started with the legs. I build my sculptures hollow using coils and slabs. This keeps the piece lighter and reduces the chance of explosions in the kiln. I like to use the natural colors of clay. 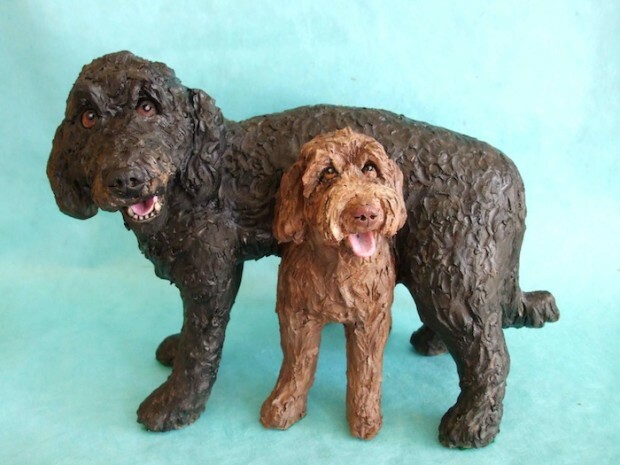 Although I built this piece from a porcelain and stoneware clay so that the two dogs would fit together nicely, you can see that I used a brown clay for the eyes. 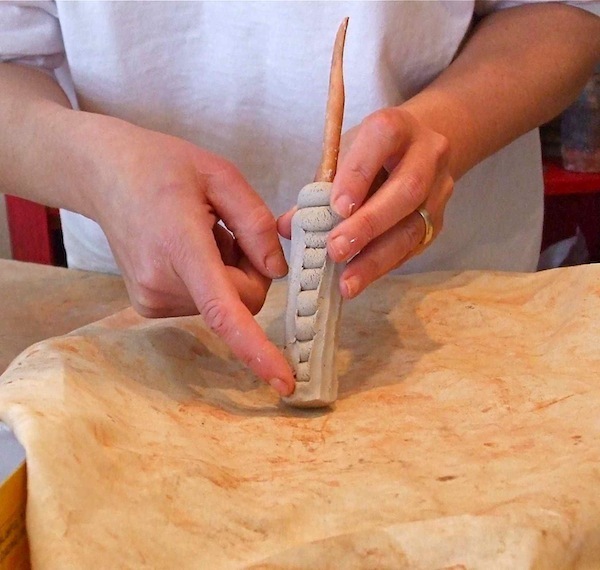 I love the natural earth tones of clay and often use more than one colored clay body in a single piece. I finish my sculptures with stains that highlight the clay's tones and textures, and I use glaze sparingly for pops of color. After this piece was bisque fired, I finished the larger doodle with a copper carbonate stain that goes on green but turns black in the kiln. I finished the smaller doodle with an an iron oxide stain. The only pop of color is their pink tongues. Finally, I say a little prayer. After applying the finish I fire the kiln to cone 5—that’s 2165° F! It's always a little terrifying to open the kiln after it cools as there are always suprises-- good and bad. 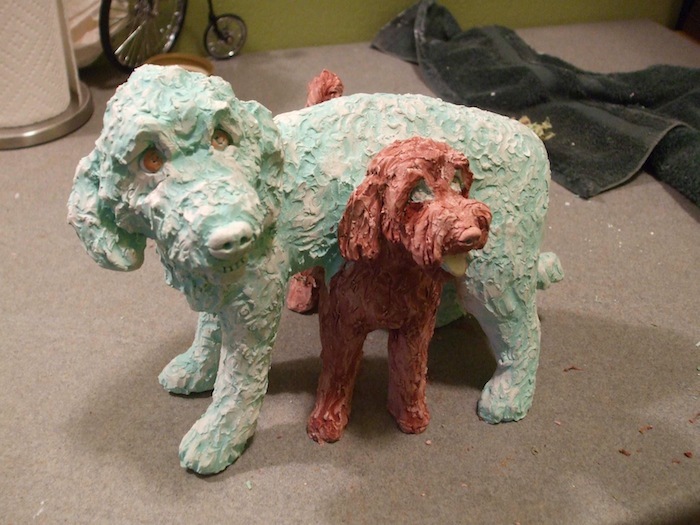 But if all goes well, I can tweak the sculpture's colors with an oil-based wash if needed, and the piece is ready to go.